Plantation Field lives up to its tagline – Best. Event. Ever. Just seven years ago, when Plantation Field held the first International Horse Trials, I remember driving down Route 82 and, realizing something horse-oriented was going on, I parked with about ten other cars and walked across the street to watch the competition in a stadium jumping arena, of sorts. Aside from the incredibly scenic cross country course, nothing of that early Plantation Field Horse Trials looks the same. It has all changed – and all for the better. 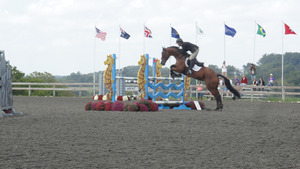 The event now draws hundreds of very competitive horse-and-rider teams from across the country and various other countries, including Canada, Ireland, Great Britain, and Australia. The organizers have made the event more attractive not only to the competitors, but also to the spectators, many of whom know very little about horse competitions. As southern Chester County is home to many Olympic-caliber eventing riders, Plantation Field has become the “home event” and not only do they all support it with many entries, but a victory has special meaning. This year’s CIC***, the highest level of competition offered at Plantation Field, culminated in a victory for Maya Black, who hails from Washington state, with a score of 52.50 (low score wins). Her horse, Doesn’t Play Fair, had finished in a tie for third in the Dressage phase and went clean with no time faults in the stadium jumping on Saturday. 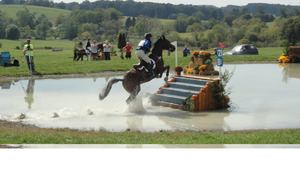 However, in Sunday’s crowd-pleasing cross-country course, which consisted of 33 jumping efforts up and down the rolling countryside, through water, woods, and ruins, the pair was just slightly over the time allowed to complete the course, and thus incurred 3.60 faults. Beech, who had tied for third with Black in Dressage blazed around the course a full ten seconds faster than Black and was one of only two (out of 50 starters) to have no time faults in the cross-country phase. He did, however, have a rail down in stadium-jumping which had given him four faults. The pair settled for a very close second with a score of 52.90. Davidson, who grew up adjacent to Plantation Field, at his family’s Chesterland farm, also rode the third place horse, Ballynoecastle RM, with a score of 55.30. Another local, Boyd Martin of Cochranville, finished fourth aboard Trading Aces with a 56.10.